We spent several days at sea sailing from Dakar to Ascension Island. I did a lot of reading, spent some time talking to people I hadn’t seen in a while, caught up on the blog, and even participated in an escape room event the Ship put together. We sailed partly around Ascension Island. The island has a green 2600’ main peak, called Green Mountain, which is surrounded by barren volcanic cinder cones and lava. The contrast is incredible and only starts to make sense when you learn that Green Mountain is green because in the mid-1800s the British imported every tropical plant they could think of and planted it there to see what would happen. 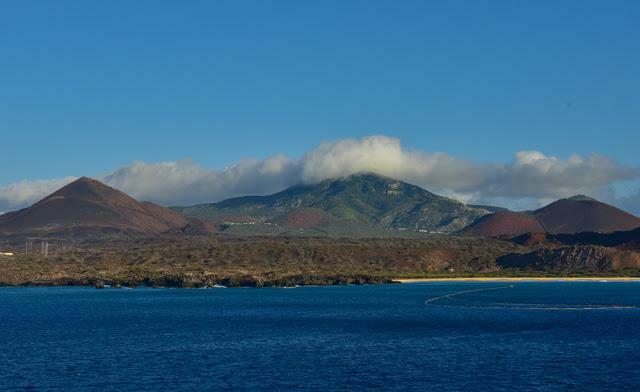 Ascension Island with Green Mountain in the middle and volcanic cones by the shoreline. 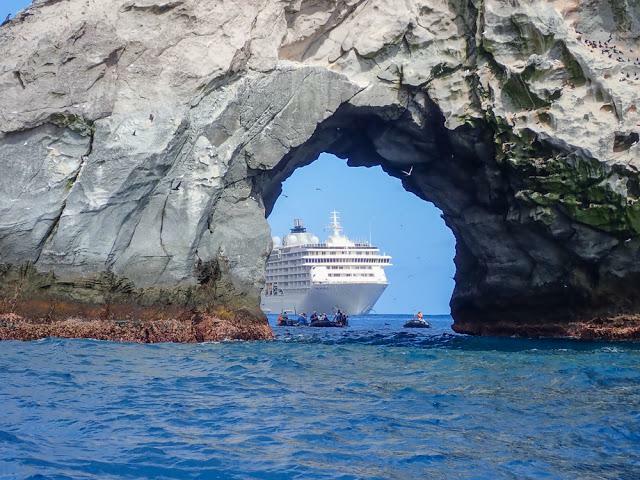 The Ship through an arch at Boatswain Bird Island. We stopped the Ship near a small rock island with an arch called Boatswain Bird Island. There were birds everywhere and the island was white with guano. The whole time we were there we could see dozens of frigate birds every time we looked up and there were white terns fishing all around us. I geared up and went diving right by the arch. The guano from the rock feeds a whole ecosystem in the water that starts with plankton, goes up through triggerfish and grouper, and ends up in sharks and giant moray eels. The water is too cold for hard corals, but the lava rock provides lots of shelters and the abundance of fish life is amazing. 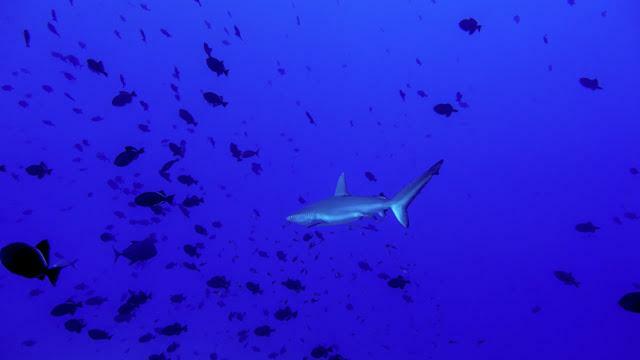 We saw eight or nine Galapagos sharks on the dive. A few bigger adults were out in the depths, but a bunch of the juveniles, only three to five feet long, were curious and would swim by for a closer look when they spotted us. After getting back to the Ship and cleaning up, I took a zodiac to Georgetown and walked around for a bit. The whole tour took 15 minutes. 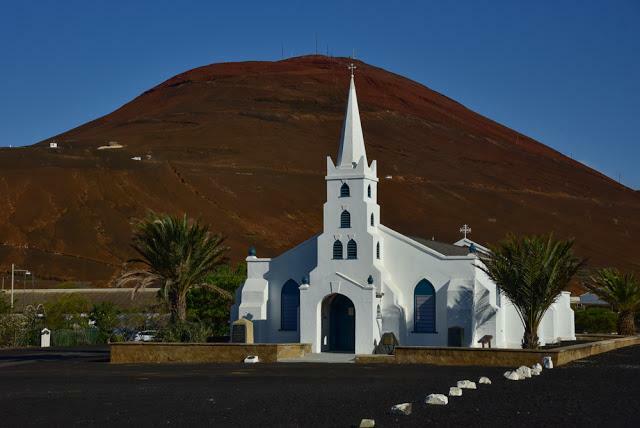 The town has a fire station, a police station, a court, a school, a church, a cricket pitch of painted green lava rock, a grocery store, and a bar. The streets are crushed lava rock, it’s incredibly hot, and the only plants are a few thorn bushes. There are a few escaped donkeys and sheep wandering around, and that’s all there is to see. 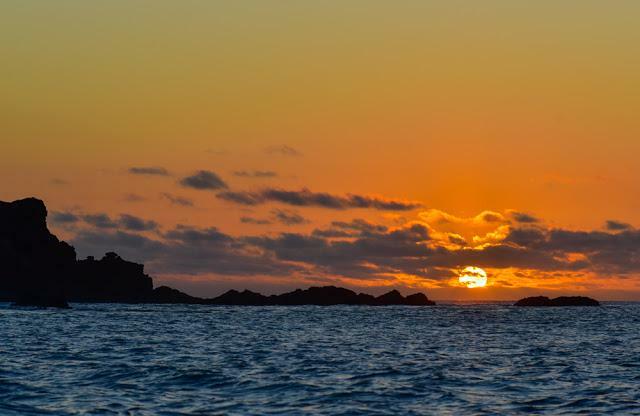 We took a sunset zodiac cruise in among huge breaking swell. I got back on a zodiac with some photographers around sunset and we maneuvered our way through rocks and really large swell to get some great views of breakers in the setting tropical sun. The tropical sunsets are very quick.